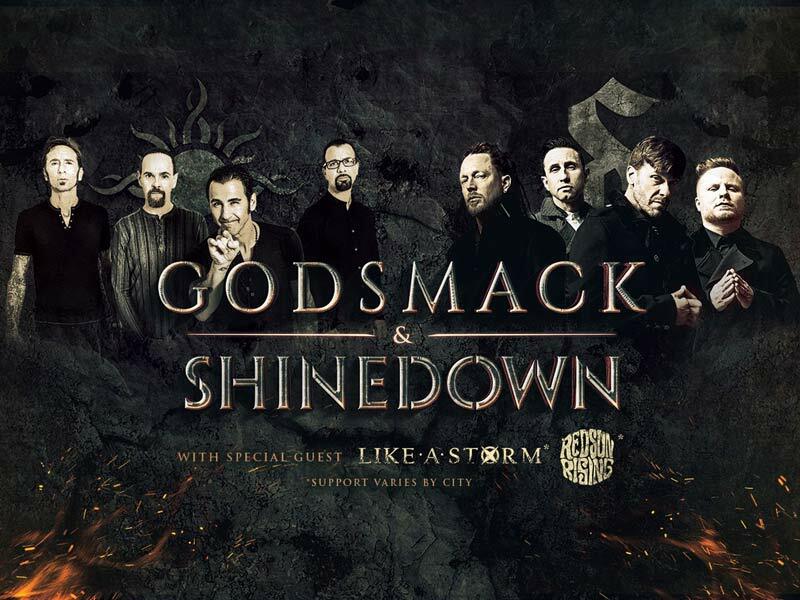 New Tour Just Announced : Godsmack and Shinedown with special guests Like A Storm and Redsun Rising. Be prepared to have your socks ‘rocked’ off by two awesome metal rock bands that will be on tour later this year. Both GODSMACK and Shinedown will be hitting the road together in late July and will be on the road through out early September. As of yet, the heavy metal duo have released about 30 tour dates so far, hitting up cities including las Vegas, Chicago, Denver, Atlanta, Dallas, Salt Lake City, Wantagh, Holmdel, Virginia Beach and more; Full Tour list can be found below. Both bands have highly anticipated new albums slated to be released soon. Godsmack is releasing When Legends Rise in late April, and Shinedown is releasing Attention Attention in early May. Not only are the two bands on tour toether, they will be hitting up a handful of metal music festivals too. On their tour there will be a number of supporting acts; So far ‘Like A Storm’ and ‘Redsun Rising’ have been announced, with more to be announced. If you’re a fan of metal music, these are shows not to be missed. I personally am a huge Godsmack fan and a Sully Erna fan, and have been since the 90s. I can’t wait to see these shows. Check down below for the latest list of Godsmack tour dates, links to look for tickets, plus some cool music videos. Godsmack and Shinedown join forces and hit the road on tour. Don’t miss your chance to see two awesome bands. Check back often to see if GODSMACK adds more dates to their tour.